Home > Stunning Beauty Vase Arrg. A The Stunning Beauty Vase is wonderful mix of Hydrangeas,Tulips, Roses and Gerberas and a sweet touch of crisp purple statice. Substitutions may occur. but it will always be stunning. 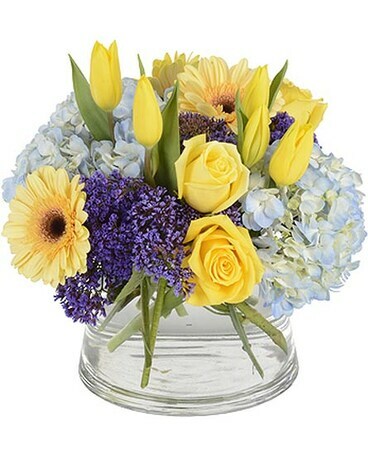 Blue Hydrangeas, yellow Tulips, Roses and Gerberas mixed in with crisp purple Statice. Substitutions may occur.